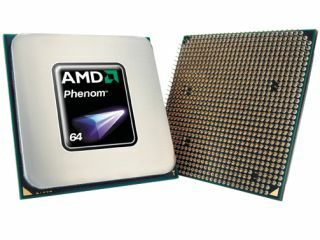 The wraps are officially off the new triple-core revision of AMD's Phenom CPU along with quicker quad-core models. Surprisingly, AMD said its new triple-core Phenom X3 remains saddled with the infamous bug that has affected the launch of the Phenom line. Still, for what it's worth the tri-core layout of the Phenom X3 range is a first for PC processors. It's a core count currently not offered by Intel. As for the much needed revision of the quad-core desktop Phenom CPU, it not only brings faster clocks but also new circuitry tuned to tame the so-called 'TLB' bug. The new chips are clearly a step in the right direction. But are they enough to turn around AMD's fortunes? One thing is for sure AMD is sure pricing these models very competitively - more on that later. First up is the Phenom X3 triple-core processor. AMD's Leslie Sobon confirmed the new processor is essentially identical to a quad-core Phenom chip, but with one core disabled. However, she flatly denied the suggestion that quad-core chips with one dud core were being used to knock up Phenom X3s. If true, it's an odd state of affairs. Does AMD really intend to hobble perfectly good quad-core chips and flog them as triple-core? Wouldn't it make sense to increase its margins by using 75 per cent functional quad-core dies that will otherwise be consigned to landfill? We may never know. Anyway, at launch AMD is announcing two Phenom X3 models. The X3 8400 clocks in at 2.1GHz and sports 512K cache per core and 1.5MB of shared cache memory. The 8600 cranks things up to 2.3GHz with the same cache counts. Both are rated as 95 watt chips and are compatible with most AM2 and all AM2+ motherboards. Spearheading the phalanx of new Phenom X4 (AMD says it has resurrected the 'X4' suffix due to customer demand) quad-core models is the 9850 Black Edition. As with previous 'Black Edition' chips, the 9850 has an unlocked multiplier for painless overclocking. Speeds and feeds for this new range topper are 2.5GHz with 512K cache per core and 2MB of shared cache. Welcome though the boosted frequency is, it does come at a price. The 9850 BE is rated at 125 watts, a fair few notches higher than the new 9750 2.4GHz model, which is a 95 watt chip. As indeed are the 9650 and 9550 models which round out the revised Phenom family. They're 2.3GHz and 2.2GHz quad-core CPUs respectively, by the way. Also worth scrutinising are the final two digits of the new processors' model numbers. The new '50' series Phenom X4s denote the latest silicon revision which, according to AMD, finally banishes the nasty little TLB bug present in all previous Phenom processors. The bug causes instability in certain situations and the firmware workaround AMD created to address it comes at a significant cost in terms of performance. It's therefore a bit of a shocker to note the first triple-core Phenoms are buggy '00' chips rather than being based on bug free '05' silicon. AMD says '50' series Phenom X3s will come later. But what about pricing? This is where things get really interesting, not to mention worrying for AMD. The 2.5GHz Phenom X4 9850 BE is yours for just £115. The 2.4 and 2.2GHz models weigh in at £105 and £95 respectively. As for the Phenom X3s, AMD is currently declining to divulge precise positioning. All we know is that they will be even cheaper than the X4 range. In the short run, that's just gravy for punters looking for a good deal on a multi-core PC. But it must be absolutely decimating AMD's bottom line. Back in 2005, remember, AMD's top dual-core Athlon chip was changing hands for around £600. Even the relatively feeble Athlon 64 X2 3800+ commanded over £250. Today, AMD can't even manage half of that figure for its flagship quad-core processor. Question is, therefore, exactly how long can it afford to be restricted exclusively to the budget end of the CPU market? It would be a tough job for a well funded AMD to close the gap to Intel. But how is it going to fund the intensive R&D required to take the fight to Intel with the current firesale on all AMD CPUs? We dare not speculate. In the meantime, AMD says the revised Phenom X4 family will be available “just after” today's official launch. Phenom X3s will be flowing in mid to late April.